I was somewhat overwhelmed by the enormity of the task ahead…. I have now completed the patchwork of the quilt top. To the original 25 blocks I added a narrow border of Green background bird print cotton purchased from Fabricland (this print is also used for the backing of the quilt).Then, and I don’t know what possessed me, I made a further 28 (yes 28!) 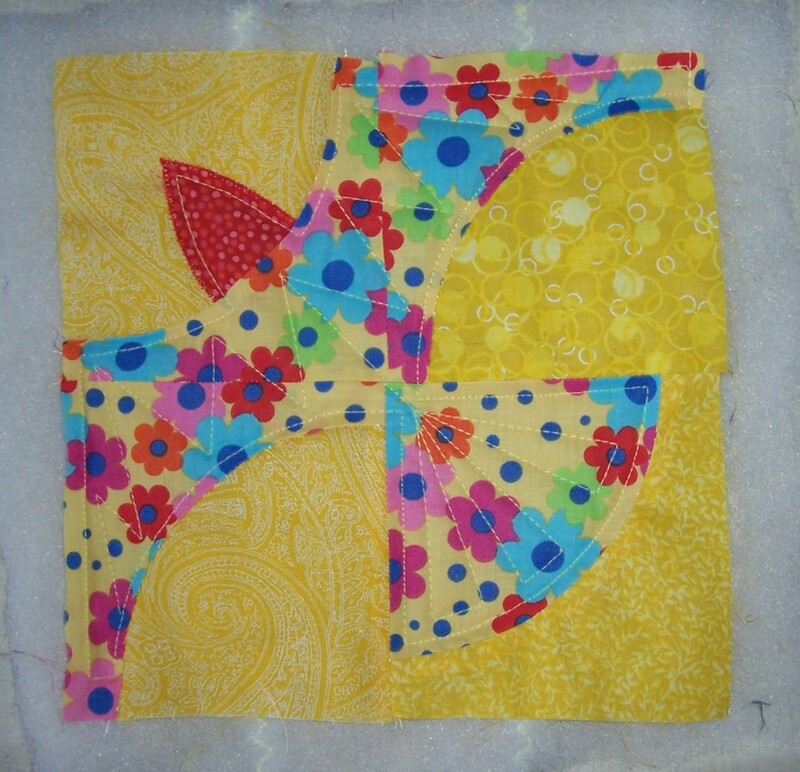 drunken bird blocks for the outer border. This has brought the size of the quilt top up to approximately 64 inches which is a little over the size that I normally make for later display on my husband’s grand piano. 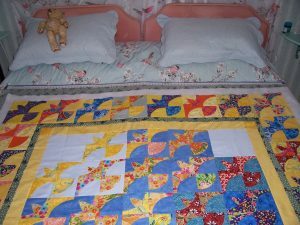 I purchased some polyester wadding from New Threads Quilt shop and on a rainy Sunday afternoon I laid out the backing, wadding and quilt top on our twin beds and ‘layered up’ the quilt. 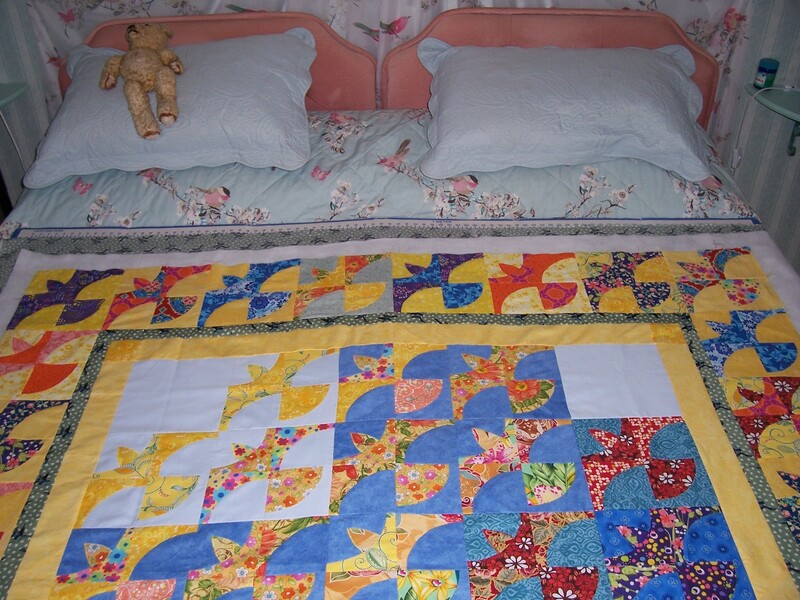 I used 505 temporary spray adhesive and quilting safety pins to keep all the layers together and set the quilt aside whilst I thought about how to quilt…..
Three weeks later I had a couple of additional blocks that I had hand-stitched at Sprat & Winkle Quilters club evenings. 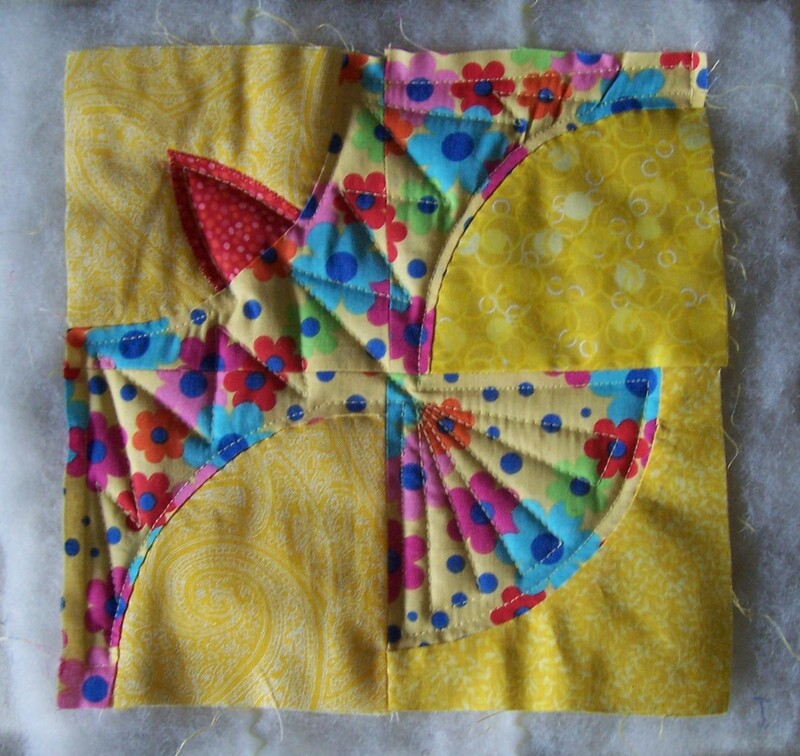 I used these for trialling a quilting design. I am happy with the quilting within the bird shapes but at present am not sure how I will deal with the empty spaces of the backgrounds. Possible cloud shapes? For now I am taking yet another break from this project so that I can make a Red dress to wear on 3rd June when my husband and I will celebrate our RUBY wedding anniversary.